Luxury brands continue to do well as the consumer rebounds. These brands are finding new consumers in the international marketplace. In addition, men are the new target for luxury brands as men seem to have developed an eye for fashion. Both Tiffany (TIF) and Coach (COH) are listed in the top 50 brands in the U.S., as published by Interbrand in the “Best Retail Brands 2012.” Both of these stocks are considered strong buys especially if we get a market pullback. Tiffany & Co. (TIF) continues to flourish where many luxury goods have struggled. Store expansion continued in 2011 with the restraint and discipline befitting a luxury brand. The brand has been able to successfully offset rising commodity costs through increased merchandise pricing. Active in both product development and promotions, Tiffany’s successful multimedia campaign “What Makes Love True?” was recognized as a best-in-class example of a luxury retailer using digital. The company’s increasing focus on environmental and social leadership is a growing component of the brand; it is clear about its diamond supply chain partners and practices. The appeal of the iconic blue box is universal, as demonstrated by Tiffany’s continued international growth. in Continental Europe and the AsiaPacific, its improving operating efficiencies, and its compelling valuation, we think TIF remains an attractive long-term investment. TIF has increased annual dividends each year since 2003 and has a current yield of 1.71% based on a 31% payout ratio. TIF has a Dividend Growth 5 Year Average of 23.73%. A consistently renowned American heritage brand of accessible and aspirational luxury with high positive social media scores, Coach (COH) has 500 stores in the U.S and Canada and enjoys an evergrowing presence globally, most recently entering Brazil and Vietnam. The company is experiencing tremendous growth in China due to the explosion of middle income families who aspire to higher-end brands. To protect its brand, Coach initiated a major crackdown on counterfeiters and trademark infringers. It also created a new brand, Reed Krakoff, to deliver a slightly different design aesthetic at a higher price point. All things related to the brand filter through Coach’s executive creative officer to keep brand focus sharp. The result is continued double-digit growth. In FY 11 (Jun. ), COH estimated the U.S. addressable market for women’s accessories and handbags grew to 10%, to $9.3 billion as the company grew more rapidly, expanding its domestic market share. A re-emphasis on Coach Men’s also doubled the business to about $200 million, and a focus on expanding Asian distribution increased COH’s market share in China to 6%, or $185 million. We see favorable long-term sales and earnings prospects for COH, as much based on management’s acumen as on global brand potential. While sales of $400+ handbags weakened in the December quarter, North American comparable-store sales rose a strong 8.8% on top of a year-ago 12.6% gain. We view the company’s core $198 and $298 price points, which we believe appeal to broad range of shoppers spanning the high-end to value, and frequent in-flow of new products as competitive advantages. We also see a growing retail business in Asia and further development of Coach Men’s expanding COH’s global market opportunity. In the five years through FY 11, COH posted a revenue compound annual growth rate (CAGR) of 15%, a gross profit CAGR of 14%, an EBIT CAGR of 13%, and an income from continuing operations CAGR of 14%. Total assets rose at a five-year CAGR of 10%. Capital expenditures were $148 million in FY 11, up from $80 million in FY 10, and for FY 12 COH estimates a $200 million capital budget, supporting global store expansion and investments in technology. COH’s returns on assets, capital and equity exhibited substantial improvement in FY 10, posting gains of 340 bps to 680 bps. FY 11 returns were 32% for ROA, 52% for ROC, and 57% for ROE, and were at the top of the peer group. We expect COH to maintain industry leading financial and operational metrics, and we regard the COH management team as excellent brand stewards that uphold strong operating disciplines, and we forecast incremental improvements in gross margin along with SG&A leverage on increasing scale over the long term. COH has increased annual dividends each year since beginning payments in 2009. COH has a current yield of 1.18% based on a 25% payout ratio. In the past, we have been expressing the view the equity markets were oversold and a rebound was likely to occur at any time. 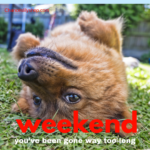 Last week’s oversized bounce was probably due to two factors, the parliamentary vote in Greece forestalling a near term default event and the end of QE2 with the resulting bubble in the Treasury market that began deflating. For the time being rising interest rates are reflecting a return to the “risk-on” condition. As we caught an upturn in the market, all of our positions are deep in profits. We have captured 90% or more of the total profits in most of our put positions. Even though we are 10 days from expiration of July options, we will take profits on all five positions today. This will give us a total of $3,992.50 profit in less than one month. This is a return of 3.99% on the starting balance of $100,000. These positions were initated on June 27 so we are only 6 trading days (8 total days) into the trade. 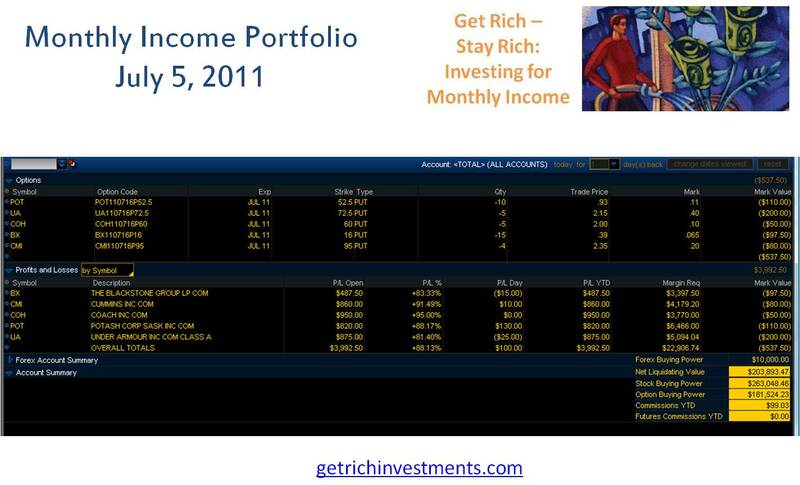 This is an annualized return of 182% which is hard to beat in most portfolios. Here is the positions today before selling them (see July Results). Since July options expire on July 16, we will add new positions for August expiration. We closed all July put positions so we did not get any stock put to us. 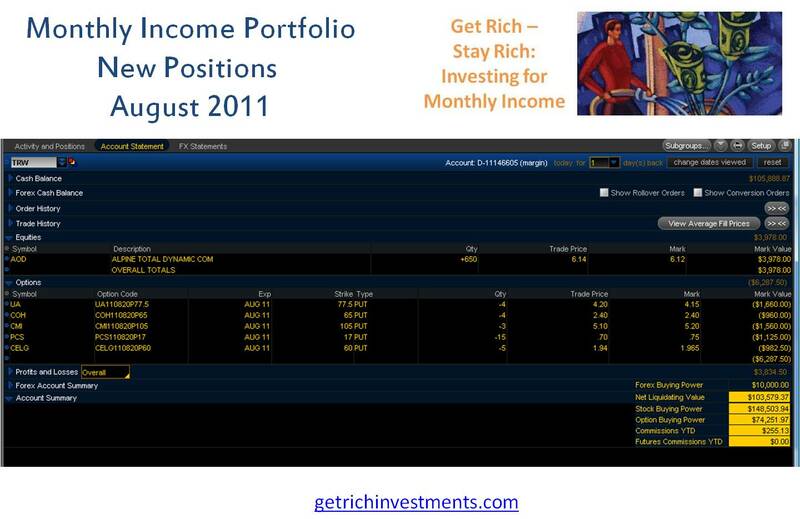 The new positions are shown in the chart below (see new positions). We will write more puts on Under Armour (UA), Cummings (CMI) and Coach (COH): all with new strike prices in August 2011. We will add two new stocks with put writes: MetroPCS Communications (PCS) and Celgene (CELG). This creates a total of $6,190 in premiums received from selling August puts from these new positions (see the breakdown by position in chart). 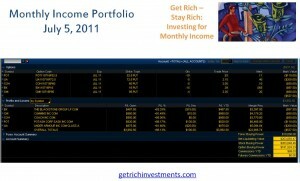 This is a return of 5.98% based on the portfolio value of $103, 579.37 shown in chart. In addition we invested $3,978 of our profits in 650 shares of Alpine Total Dynamic Dividend Fund (AOD) which pays a monthly dividend and has a yield of 10.7%. We will continue to invest profits in monthly dividend payers. Under Armour, Inc. (UA) is engaged in the development, marketing and distribution of branded performance apparel, footwear and accessories for men, women and youth. The Company’s products are sold worldwide and are worn by athletes at all levels, from youth to professional, on playing fields around the globe, as well as consumers with active lifestyles. Its products are offered in over 23,000 retail stores worldwide. Most of its products are sold in North America. The Company’s trademarks include UNDER ARMOUR, HEATGEAR, COLDGEAR, ALLSEASONGEAR and the Under Armour UA Logo. The Company’s product offerings consist of apparel, footwear and accessories for men, women and youth. Cummins Inc. (CMI) designs, manufactures, distributes and services diesel and natural gas engines, electric power generation systems and engine-related component products, including filtration, exhaust aftertreatment, fuel systems, controls and air handling systems. The Company sells its products to original equipment manufacturers (OEMs), distributors and other customers worldwide. It has four segments: Engine, Power Generation, Components and Distribution. It serves its customers through a network of more than 600 company owned and independent distributor locations and more than 6,000 dealer locations in more than 190 countries and territories. In November 2010, it purchased a majority interest in a previously independent North American distributorship. On January 4, 2010, it acquired the 70% interest in Cummins Western Canada (CWC). In April 2011, the Company sold its exhaust business to Global Tube. Coach, Inc. (COH) is a marketer of fine accessories and gifts for women and men. Coach’s product offerings include handbags, women’s and men’s accessories, footwear, business cases, jewelry, wearables, sunwear, travel bags, fragrance and watches. Coach operates in two business segments: Direct-to-Consumer and Indirect. During the fiscal year ended July 3, 2010, the Company introduced Poppy, which offers a variety of silhouettes. It also introduced additional lifestyle collections. The accessories include women’s and men’s small leather goods, novelty accessories and women’s and men’s belts. The Company’s footwear is distributed through select Coach retail stores, coach.com and over 950 United States department stores. The wearables category consists of jackets, sweaters, gloves, hats and scarves, including both cold weather and fashion. During fiscal 2010, Estee Lauder Companies Inc., through its subsidiary, Aramis Inc., became Coach’s fragrance licensee. MetroPCS Communications, Inc. (PCS) is a wireless telecommunications provider in the United States measured by the number of subscribers served. The Company offers wireless broadband mobile services under the MetroPCS brand in selected metropolitan areas in the United States. The Company provides a variety of wireless communications services to its subscribers on a no long-term contract, paid-in-advance basis. As of December 31, 2010, the Company had approximately 8.1 million subscribers. Its products and services include voice services, data services, custom calling features and advanced handsets. At December 31, 2010, the Company had thirteen operating segments based on geographic regions within the United States: Atlanta, Boston, Dallas/Ft. Worth, Detroit, Las Vegas, Los Angeles, Miami, New York, Orlando/Jacksonville, Philadelphia, Sacramento, San Francisco and Tampa/Sarasota. Celgene Corporation (CELG) is a global integrated biopharmaceutical company. The Company is primarily engaged in the discovery, development and commercialization of therapies designed to treat cancer and immune-inflammatory related diseases, such as immunomodulation and intracellular signaling pathways in hematology, oncology and immune-inflammatory diseases. Its primary commercial-stage products include REVLIMID, VIDAZA, THALOMID (inclusive of Thalidomide Celgene and Thalidomide Pharmion), ABRAXANE and ISTODAX. Other sources of revenue include sales of FOCALIN to Novartis Pharma AG (Novartis), which is a licensing agreement with Novartis, which entitles it to royalties on FOCALIN XR and the entire RITALIN family of drugs. On January 15, 2010, it acquired Gloucester Pharmaceuticals, Inc. (Gloucester), which is a privately held pharmaceutical company. On October 15, 2010, the Company acquired Abraxis BioScience, Inc. (Abraxis).